The incident is the deadliest on the peninsula in years. The mosque was known as a gathering place for Sufi Muslims. The Sinai is the Islamic State’s favourite battleground. Cairo (AsiaNews/Agencies) – At least 235 people have been killed and 130 wounded in an attack today on a mosque in the northern Sinai. 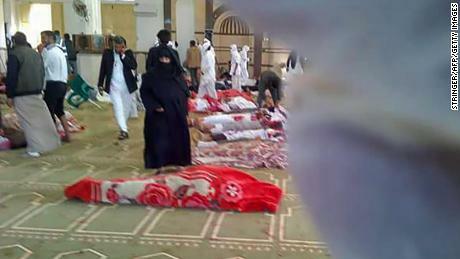 The massacre occurred during Friday prayers in the al-Rawda mosque, in the town of Bir al-Abed. Islamist militants launched a bomb against the mosque, then gunmen opened fire. No one has yet claimed responsibility for the attack, the deadliest in the Sinai Peninsula in years. According to local sources, the victims are all Sufi Muslims, deemed apostates by the Islamic State (IS) group. The attack is but one in a series against non-Muslims as well as non-mainstream Muslims. Over the past year, Egypt’s Christian community has been the subject of several acts of violence, the latest being an attackagainst a bus carrying Coptic pilgrims on 26 May. Scores were killed. The Islamic State has led an insurgency in the Sinai for several years. The region is a mostly barren, underpopulated desert. The group’s campaign is aimed at overthrowing the government of President Abdel Fattah al-Sisi.